Sedona. Plan to stay more than a day! There is a place, unlike anywhere else on Earth. Where you can walk among ancient red rocks. Where crystal streams double as fountains of youth. A place where your spirit will soar, and your heart will race. Where a simple stroll can turn into an adventure of a lifetime. Where you can unplug from life as you know it, and connect to what’s really important. That place is Sedona, Arizona. Delve deep into this vast landscape defined by a unique collection of soaring stone monoliths in vibrant reddish hues. Explore slashing canyons, evergreen forests and quiet oases. Despite the small town charm of Sedona, red rock country is surprisingly large. Over 1.8 million acres (7,300 square km) of national forest land encircle the community. Trails and jeep roads branch out in all directions. So even frequent visitors rarely have a chance to do more than scratch the surface. Yet there’s so much more to see if you only know where to look. A wild country of mountains and mesas and sprawling valleys is spread beneath blue skies and an endless supply of sunshine. This is a land held sacred by Native Americans and where cowboys once rode. Red stone formations create a haunting skyline found nowhere else in the world. This is where Arizona keeps the Old West. 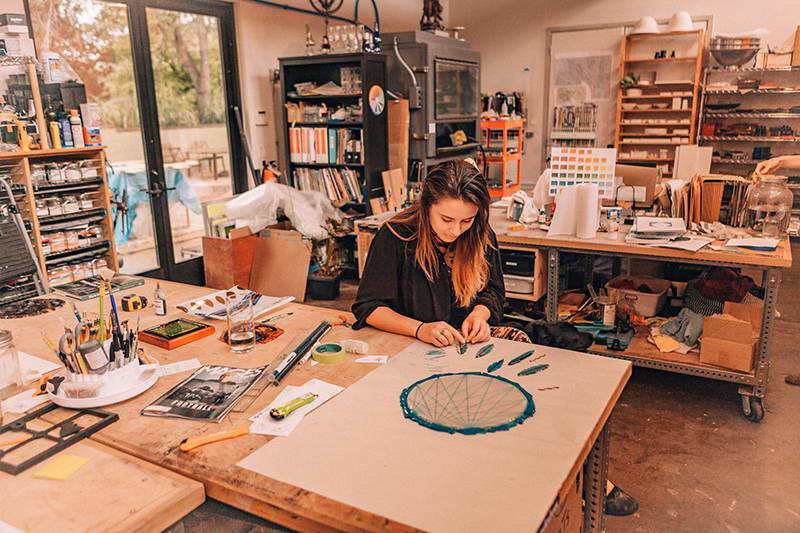 And this is where a New West has evolved, as a haven for artists, a center of spiritual health and enlightenment, and an epic playground for outdoor enthusiasts. Renowned as a place of wellness, Sedona restores body and spirit. Many visitors come to experience the famed vortex sites that are conducive to meditation and self-exploration. Whether the energy originates from the vortex or just the staggering natural beauty and clean forest air perfumed by pine and cypress, this is a healthy place to be. Especially when additional time is spent at any of the soothing spas offering treatments designed to restore harmony and balance. Everyone can chase his or her passions amid Sedona’s breathtaking grandeur. Hikers can traverse the broad back of Schuerman Mountain, an extinct volcanic mound. Follow a beautiful ridgeline down to the cool waters of Oak Creek on the Huckaby Trail, circle a distinctive stone tower and watch it transform into the famous “Three Fingers” formation on Chimney Rock Loop or explore the fragrant forests of Woods Canyon. Mountain bikers can follow the swooping curves of the Girdner Trail down to Dry Creek, zoom across the red rock ledges of the Mescal Trail or cruise through hillsides shaggy with manzanita on Deadman’s Pass. Experienced bikers can catch some air on Llama Trail or make the steep climb on the Ridge Trail providing splendid views of Red Rock Crossing. Yet there are plenty of routes for all skill levels. Enjoy areas that are easily missed. Picnic among the orchards of Jordan Historical Park and visit an informative museum while there. Savor a sunset from the high perch of the Merry-Go-Round, as the western horizon blazes with color and soft light melts down the cliffs like warm honey. Stargaze at a glittering canopy of celestial bodies from the base of Doe Mountain with unobstructed wraparound views of the heavens. Feel your spirit soar at the Chapel of the Holy Cross, where all faiths come to marvel at the views and architecture of the little church rising between two stone pillars. Explore the ancient pueblo of Honanki Heritage Site, an elaborate cliff dwelling nestled against red cliffs and surrounded by mysterious petroglyphs, symbols etched into the rocks. One reason the historic buildings and heritage sites are so well preserved, along with the unspoiled natural beauty is due to Sedona’s commitment to sustainability. Every year more steps are taken to make Sedona an even greener community. Recycling is increased, restaurants serve more locally sourced food and many of them have gone straw-free, bicycle pathways are added, significant strides are made for funding trail maintenance, visitors volunteer to assist the great efforts to clean Oak Creek, and water conservation steps are implemented. Everyone wants to protect this piece of paradise for future generations. 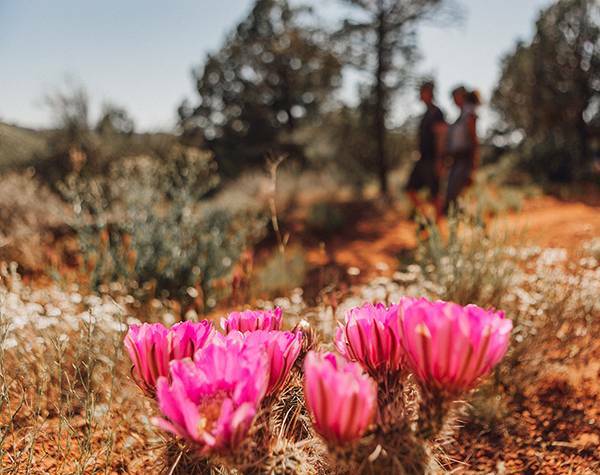 No matter the season, Sedona has a way of pulling people outdoors. Each time of year seems especially vivid, an idyllic version of what we want that season to be. At an elevation of 4,500 feet (1,370 m), Sedona enjoys deliciously mild summers with comfortable mornings and evenings and yes, a bit of heat in the afternoon—perfect weather for swimming holes, canyon picnics or a creekside massage. Winters have just enough nip in the air to enhance a cup of evening cocoa. The rare snowfall is almost always confined to the shoulders of the mighty formations, adding a decorative frosting that makes the perfect setting for a family photo. Even amid the epic scope of the landscape, there’s an unexpected intimacy to Sedona. Surrounded by the wide-open spaces is a very real and welcoming community. 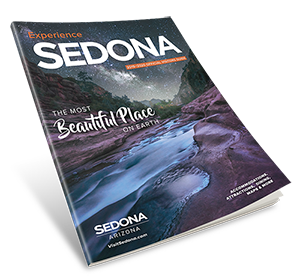 Long beloved by travelers, Sedona is also blessed with a broad hospitality infrastructure of world-class resorts, intimate B&B's, spas, restaurants, shops and dozens of galleries filled with the work of renowned artists. Along with the numerous outdoor locations art galleries are located in creative centers such as the Village of Oak Creek, Uptown Sedona and Gallery Row. You will enjoy every artistic medium including whimsical kinetic sculptures, contemporary jewelry, fine art paintings, large format photography, stained glass, ceramics, woodcarvings and many more. Native American art and influence are also a prominent part of the scene with handcrafted silver and turquoise jewelry, pottery, carved kachinas, woven baskets, intricate Navajo rugs and Western bronzes on display. There are vacations and then there are vacations in the Most Beautiful Place on Earth. There will always be more to see and do. Come back to Sedona as often as you like.